I Feel Like Funkin’ It Up…Feel Like Funkin It Up! Here I go again with the TV show ties…The title is a reference to a song by The Rebirth Brass Band most recently used in the show Treme‘ and one I heard live during a recent New Orleans trip. Well I do feel like Funkin’ it up! I hope you do too because….. 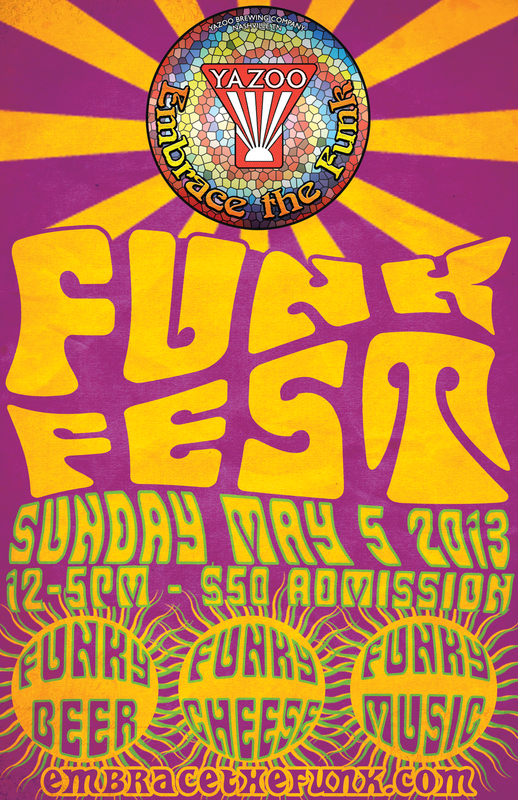 Here is the official announcement that on May 5th at Yazoo Brewing Company we are hosting a Funk Fest! We will feature multiple beers from our Embrace The Funk series plus a bunch of other funky/wild beers I was directly involved in selecting (even some selections from brewery friends of the blog!). As many of you know one of the main purposes of this website is to help educate and attempt to show how wonderful these beer styles can be. So myself and Neil McCormick who is the “Beer Evangelist” at Yazoo have worked on an awesome line up that runs from one end of Funk to the other end of Sour! Come Embrace The Funk and enjoy funky cheeses from local Artisan Cheesemakers “The Bloomy Rind” while a DJ spins the vinyl funk! Tickets are very limited, 200 available here. These tickets will sell out, so please don’t miss out! This is going to be a lot of fun! Now onto the other exciting news. A few months ago New Belgium approached us about creating a special beer for Memphis Craft Beer Week. As a fan of their sour beer work and interviewing Lauren Salazar last year I was pumped about working with her on this project. It began with a few emails between Lauren, Linus and me with ideas on what styles we could bring together and what we were hoping to achieve. Once we nailed down the target beer this project really kicked into gear. For our portion of this beer we brewed a white wheat and pale malt base beer mashed at 154F which was 100% fermented with 2 variants of Brettanomyces. The breakdown of the Brett blend is 75% B. Lambicus and 25% of a proprietary Brett pitched at 72F which self rose to 74F. We achieved 89% attenuation within 14 days of pitching into the stainless conical. We chose to fruit the beer with Currants and Blackberries. I felt like those fruits would go well with the characteristics Brettanomyces Lambicus gives (think cherry pie/dark fruit). Looking at our portion of the beer it is a crazy neon pink/purple color. Pictures simply don’t do it justice. 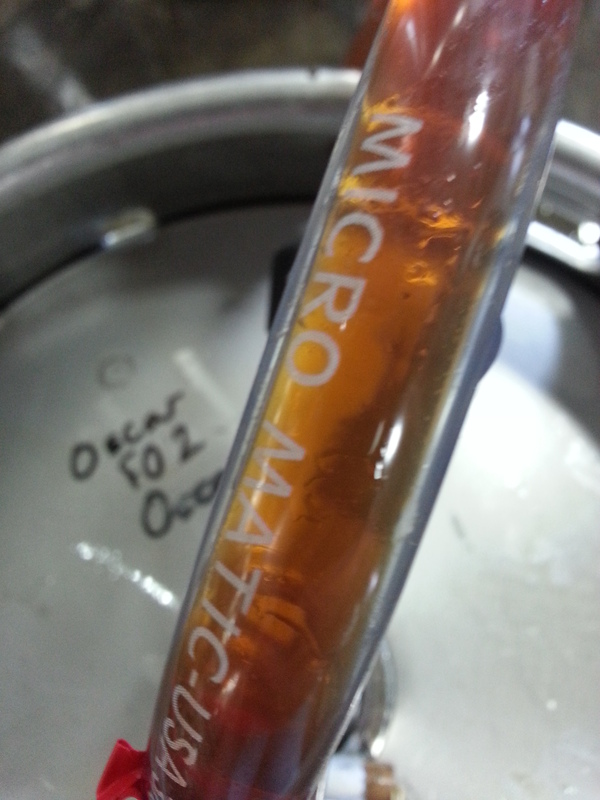 Once our beer hit a stable gravity and we liked the flavor/aroma, it was time to blend…New Belgium sent us “Oscar” directly out of Foeder #2. For those who don’t know, Oscar is their dark sour base beer they use to build LaFolie blends and as an ingredient in some of their other Lips of Faith beers. 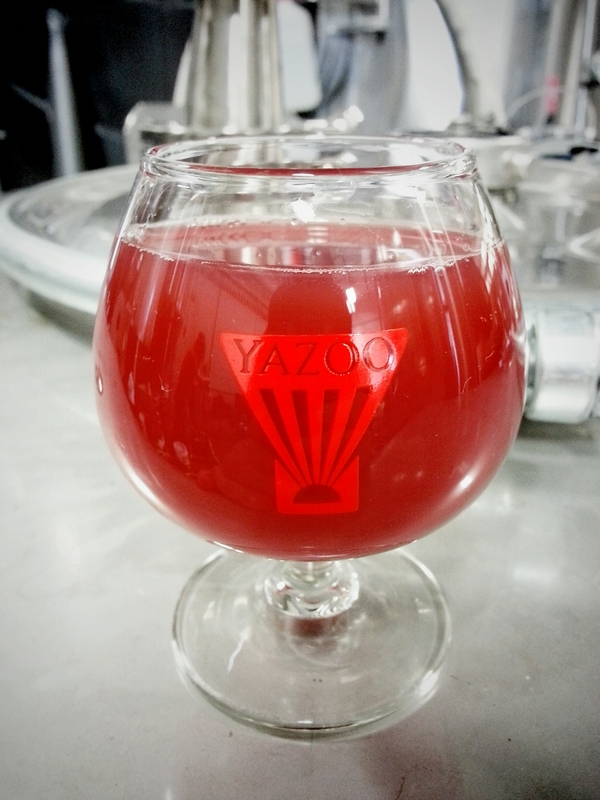 The resulting collaboration between Yazoo and New Belgium is named “Rufus“… dry, wild, tart, dark fruit forward with a solid sour backbone and slight caramel malt finish. The beer will first release in Memphis throughout the week at these locations. A Nashville release will follow. As of right now there are no plans for a bottling run so this beer will be draft only in Tennessee. A lot of fun funky stuff going on in Nashville. Last week we acquired a new to us, but used 7bbl stainless conical from another brewery that is now dedicated Embrace The Funk equipment. In fact one of our beers for SAVOR is hanging out in it right now! Again I hope to see some of you at our Funk event on May 5th. I know this event will sell out so please don’t get left out! I’m very proud of the lineup we chose for you, see you there! Make sure you follow Embrace The Funk on Twitter and Facebook. What are we, chopped liver? Knoxville, Tn. You remember us. We’re over on the hilly end of the state. Designate a couple of sixth barrels for Suttree’s High Gravity Tavern or risk us talking bad about you and grabbing a funky beer from someone else. Hey now! Don’t you spoil the good name of chopped liver!I was born in Knoxville and grew up in Clinton so my hope has been the beer will see some distro in the area and I will be able to attend. It’s just a matter of working it out with my schedule. Oh my, a Clinton Dragon. Dupree is right – get this thang over to Ol’ Suttrees so the good Yazoo supporters and Purveyors of Funk can enjoy this elixir. I will be attending the Funk Fest so I’ll get a small fix whilst there. How did NB package Oscar to ship? Do you know what kind of container it was in? Just curious – researching ways to feasibly transport bulk wort/beer. Have fun with MCBW & Funk Fest – sounds like an awesome time! We’re also smack dab in the middle of festival season, but MCBW sounds like something I’ll have to experience soon. Pingback: Professor Good Ales » Post Topic » I Feel Like Funkin’ It Up…Feel Like Funkin It Up! Brandon, this is awesome!! I’m so excited! Will you be releasing a beer list prior to the fest? I had Rufus last night during memphis beer week. Great collab! Really enjoyed it. served too cold, it had a slight sourness to it, no funk, and you could tell there was fruit, but couldn’t pick it out. Once it warmed up, the sourness and the funk really shined. Great job.